The aging process does not only affect the living, but it affects our homes as well.You may not see it at first but when you stop and take a closer look your walls may have cracks and nails coming out from underneath the paint. Or you may have a new house with an unfinished basement that has wood walls that aren't very attractive to your eyes. 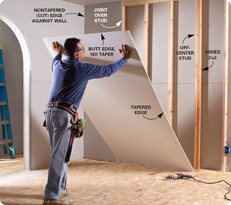 You may realize that once you have your basement finished with some panels on the walls, you can use the space much more efficiently than before. In some cases, the kids may have caused an indentation in the wall while they were playing or another minor accident could have caused a dent. Fixing all these problems and making your living space enhanced, is in your hands. Call us and add pure beauty to your home by fixing up the walls. And give your home the change it deserves. Copyright � 2010 MR.FIX IT. All rights reserved.